Law of Attraction Advanced Practitioner Certification! Don't be mislead by other programs that make similar claims but don''t have the expertise of the teachers we have. This course is for anyone looking to take their Law of Attraction certification to the advanced level at which you can teach it to others and have them effectively attract everything they desire. In order to qualify for this certification, you must first complete the Basic LOA Certification program. In the professional arena, this course will take you to the next level and position yourself to have people pay you for your knowledge and expertise as well as train you specifically on how to increase your business. A. A "Certified Law of Attraction Advanced Practitioner" qualified by our standards to teach and practice the mechanics involved in the Law of Attraction. Q: Will I be properly trained if all I take is your online Advanced Law of Attraction Practitioner Certification program? A: Ideally a Law Of Attraction Advanced Practitioner would be trained in a classroom setting with an instructor physically present. Unfortunately, this luxury is not practical for many people. When we factor in airfare, hotel, time away from work and family, etc. the costs both monetary and otherwise quickly add up. For this reason, many institutions have turned to online training as a viable alternative to meeting modern day needs. In fact, Columbia, Harvard, and Cornell have extensive online programs. Also, Penn, Dartmouth, and Yale offer online classes. Steve G. Jones, while working on his doctorate in education, extensively studied the online programs offered by Ivy League schools. 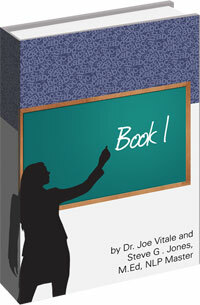 He then was able to take what he learned from those curriculum and combine it with Dr. Joe Vitale's adept knowledge on the Law of Attraction to create a Law of Attraction training program that offers a similar level of training. Additionally, in this course, you are encouraged to find a study partner and to practice your techniques on a number of people. Dr. Steve G. Jones, while working on his doctorate in education, extensively studied the online programs offered by Ivy League schools. 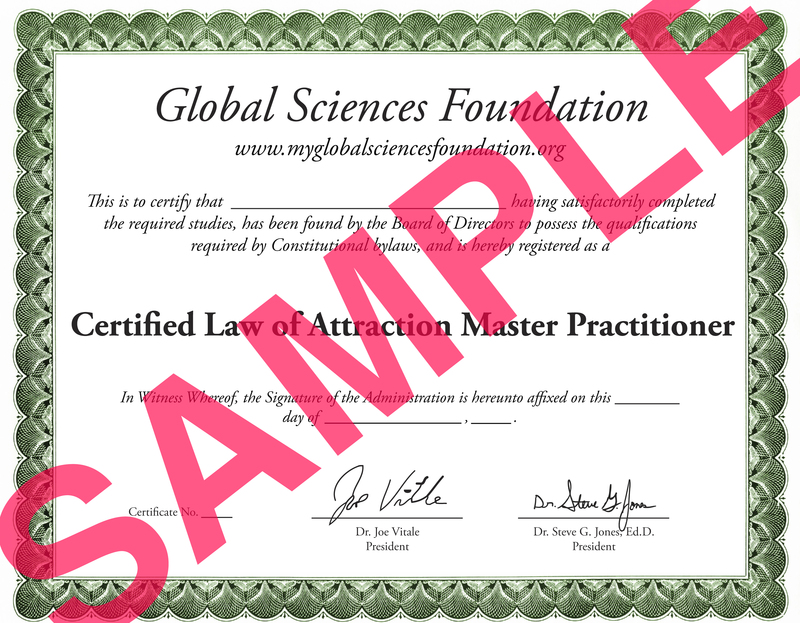 He then was able to take what he learned from the curriculum and combine it with Dr. Joe Vitale's adept knowledge on the Law of Attraction to create the Law of Attraction Master Practitioner Certification Course that offers a master level of training. Additionally, in this course, you are encouraged to find a study partner and to practice your techniques on a number of people. Q: What about licensing requirements for Advanced Law of Attraction practitioners. Are there any? A: At this time, to the best of our knowledge, there are no licensing requirements for Law of Attraction Advanced practitioners anywhere in the World. However, if you start a business, you will generally need a business license. Q: What do I get when I buy the Law of Attraction Advanced Course? A: You get instant access to all 5 training manuals and exam materials. A: It takes about 2-3 weeks if you move quickly by reading the training manuals. A: Exam instructions are on the last page of eBook #5. You must pass the multiple-choice test on the database with a score of 75% or better. If you fail you have a max of 3 times to pass. If you don't pass by the third attempt, you will not be able to take the exam again for 2 months. Once you pass the multiple-choice exam, you will then submit an essay for Dr. Steve to review. A: Upon completion of this program, you will receive a beautiful certificate sent via email, which you can print out and proudly display for your clients to see. It will have your name, title (Certified LOA Advanced Practitioner), and your certification number. Q: I am a layman with no Law of Attraction background. Will this program actually take me from the ground floor up and teach me everything I need to become a Law of Attraction Advanced Practitioner? A: Yes. This program is extremely thorough and it will teach you everything you need to know to be a certified Law of Attraction Advanced Practitioner and help you run your own practice. A: This home based course, is designed to be a resource for you for the rest of your life, to teach you Advanced-level Law of Attraction techniques and how to effectively use it to your advantage.